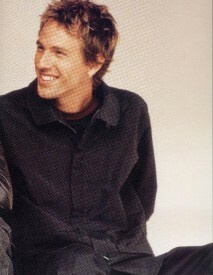 Daniel Jones was born on July 22nd, 1973, in Essex, London, England to John and Christina Jones. He was the youngest of three boys. He lived in England for one year, then his parents decided to move to Brisbane, Australia. (That's where he learned to crawl, on the ship!) Dan went on to high school, but he later dropped out in the tenth grade to persue his musical carrer. Dan's favorite thing to eat is chocolate. To drink, he is very fond of beer. However, Daniel has been arrested for being "drunk and unruly". Daniel's favorite scents on a woman are Fendi and Channel No. 5. Some of the music he enjoys listening to is: Peter Gabriel, Sheryl Crow, INXS, and Tears for Fears. An interesting embarrassing moment for Daniel occured once when Daniel was in high school. He tried sneaking into his girlfriends house, and as he reached the backyard, he heard dogs barking. When he couldn't figure out where they were, he jumped into another yard. Unfortunately for Daniel, that is where the dogs were!!! "Makes him sing higher!" --Daniel when Darren was zipping up his (tight) body suit for a concert. "See what happens when you write songs , they make you do stupid things in front of the camera."